Liam was coughing/sneezing here and there (we woke up chilly temp; 68F in the room….) but no fever,and had good appetite. Just he had hoarse voice. I hoped he did not catch a cold. We made sure the heat was on and set the temp at 74F and the room became more comfy. He was then fell asleep afterwords. I read in the mayo clinic book that breast milk has some sort of hormone that makes babies sleepy. It might be why he fell asleep at the end. I liked watching quiet,peaceful, dreamy Liam who made smile here and there as he dreamed in my arms. That day, Liam changed 3 clothes. Last change was because when he burped big, he burped the milk in his drool as well and wet his foot and it was sticky to touch so, I changed his clothe. I let him try 3 months old clothe for the first time. He fitted well already although length is probably 1″ excess for him. He was growing right in front of our eyes so fast! We took Liam to the restaurant where we knew that not many people were dining when we normally dine at. It went smoothly. He slept through whole time. Only minor problem was that, we had to figure out how to fit the car seat on the booth we sat on. Another first time experience that day was that I used changing station and feeding room in the public for the very first time. Liam was reluctant burper as NICU staff calls him. He does not want to bend willingly and tries “stiff leg” and tries to reclining back…so took a bit time to out the room. He used to be able to sit willingly but these days.. he started to do the stiff leg things.It usually starts with starts crying wanting to drink more and the stiffen his leg. I tried to wait till he slows down and then pull out the bottle and then try to burp him but he did his stiff leg still. If he was not crying, of course,like.. milk drunk,then, he bends easily.I know there are other position of burping but sit-up seemed to be the most effective way to let him burp. Anyway, I tried searching some tricks on the net, and one of British website said to use the pacifier as distraction and then bend. I tried that and it was working at first, but Liam started to figuring out my secret trick in the sleeve and sometimes, it worked, and sometime not work. Whether he burped or not burped or tiny burp, I started waiting for 5-10 minutes after he finished his feeding and then let him sit up as the last burp time. It seemed to get the burp out more. Other than that, after the feeding,I was giving him tummy massage every time.It seemed to work. It had been very busy with Liam’s doctor visit. The highlight for the doctor visit was audiologist. 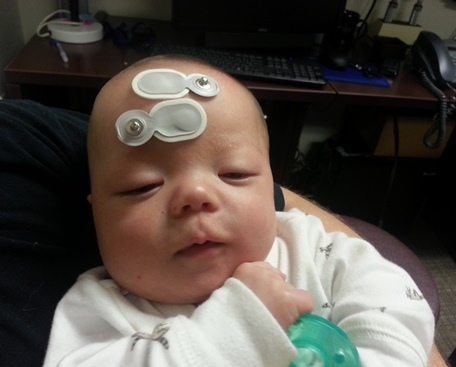 Liam had sensor stuff on his forehead,behind ears etc to let doc see brain activity for the sound he would hear through the ear plug. Liam 85 days old…. at audiologist office..
At NICU, 2 months ago, we were told his left ear hearing is inconclusive and did not pass the hearing test. They said so far, both ears looked good and can hear but, they would like to follow up after 6 months until.. possibly 2 years old. It was very very tiring day but I was glad he passed the test. Since it was very tiring day, it was easy dinner then. My husband loved my made up sauce,which I call it Korean style Teriyaki sauce.I used it for seared scallops and vegetable medley. Try and see if you like it too.